I’ve really enjoyed my week with the Bronx. I hadn’t experimented a lot with oranges in the past so I decided that this week my focus would be on finding the right orange juice for this cocktail. To start my journey I found all the oranges I could and got to juicing. From left to right they contenders are: Cara Cara Navel, Valencia, Minneola Tangelo, Moro (Blood Orange), Honey Tangerine and the bottled contender, Simply Orange (Original Pulp Free). Now, a couple quick comments. One, I realize not all of these are oranges, but they all have similar flavors so I added them to the running. Two, I had a Navel in my fridge that I was going to use for the juice off, but it was a bit leathery, so I passed. Now for some results. Cara Cara Navel – The color of Cara Cara juice, a gorgeous orange/pink, is truly the star here. They are sweet but not overly so and have little to no sourness. Valencia – Valencia juice is the flavor I naturally associate with freshly squeezed orange juice. There is basically zero sourness and the sweetness is pleasant but not overwhelming. Minneola Tangelo – Nice orangy flavor here, but with extra sourness. This quickly became my front runner for the Bronx. 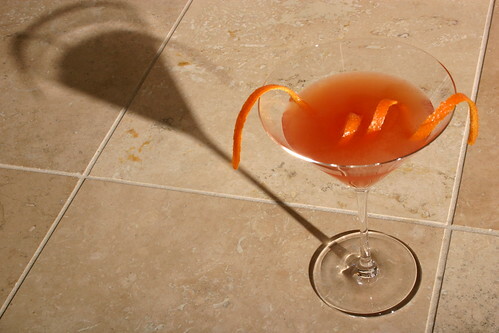 Moro (Blood Orange) – As with the Cara Caras the color is the star here. The Moro steps up though with a perfect level of sweetness for this drink and the additional sourness that some of the others are lacking. We then had two contenders for the Bronx position. Honey Tangerine – It’s quite obvious where the name for these came from. The juice is very sweet and has a distinct honey flavor. A good fruit, but not what I was looking for in the Bronx. Simply Orange (Original Pulp Free) – Sweet with nearly no sourness. Definitely lacks the brightness of fresh squeezed but it’ll do in a pinch. So, as you can see from my quick reviews I was leaning towards a juice with more sourness for this cocktail. From playing around with the Bronx I feel a juice with additional sourness leads to a more balanced cocktail. As a side note I found you can add a small dash of lemon juice to the sweeter juices to get some additional sourness. About 1/4 oz in 1 oz of orange juice worked out very nicely in the case of the Simply Orange, but I’d start with about an 1/8 then sample and add more if needed. Now for some recipes. I started with The Joy of Mixology recipe (2 oz Gin, 1 oz Orange Juice, 1/4 oz Sweet Vermouth, 1/4 oz Dry Vermouth, 2 Dashes Orange Bitters). What first struck about the Bronx is that it’s not nearly as sweet as I expected them to be. I had anticipated with the orange juice and sweet vermouth that this drink would be on the sweeter side. Not so. Instead you get wonderful gin flavor, a subtle orange sweetness and the herbal notes of the vermouth. These go down very easy, which oddly (or perhaps not so) seems to becoming a trend around here. I didn’t find the orange bitters added much other than, not surprisingly, a touch of bitterness. Overall, I’d call them optional. Next I tried out the recipe in Difford’s guide (1 1/2 oz Gin, 1 oz Orange Juice, 3/4 oz Sweet Vermouth, 3/4 oz Dry Vermouth). The result is much more vermouthy, which in this case I don’t think is really necessary. With this much vermouth you lose the subtle notes from the gin and orange juice. 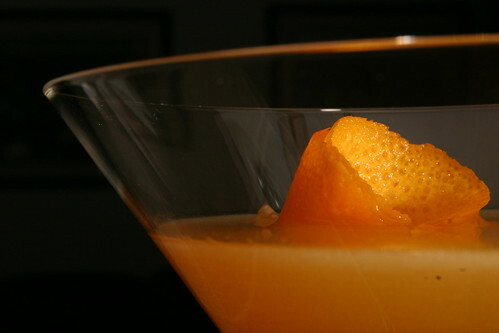 Finally I went to Wonderich’s Esquire recipe (2 oz Gin, 1 oz Orange Juice, 1/2 oz Sweet Vermouth, 1/2 oz Dry Vermouth). Basically Regan’s recipe with some increased vermouth. This version is also very dry. Sadly with this much gin the orange flavors somewhat faded in to the background. Info in hand I was ready to craft my own version of the Bronx. I like more sour notes so I suggest going with Moro blood oranges or Minneola Tangelos. I’m guessing there are plenty of other oranges that would give the needed sourness, but I live in a land locked state with zero citrus, so I use what I can find. 3/4 oz of each vermouth was too much, but 1/2 oz pumped up the herbal flavors and that worked for me. Finally 2 oz of gin seemed to dilute the orange, so for my money 1 1/2 oz is the way to go.